Hey, what’s going on everyone? 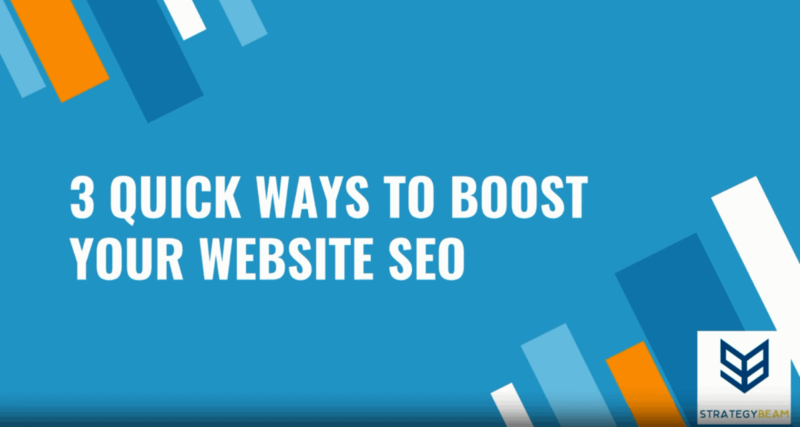 This is Chris with StrategyBeam, and today we’re going to take a look at three quick ways to boost your website SEO. These tips that we’re going to look at our more technical but super easy to implement and they can have a big impact on your websites, online presence. So the first thing we want to look at is why does this matter? And here’s why these tips matter for your SEO in business. First, we need to remember that pages rank on Google and drive qualified traffic. A lot of people would like to talk about having their website rank for specific keywords, but in reality, each page ranks on Google for specific keywords. Those keywords are related to questions and needs that your customers have. We’ve talked about that in previous videos about SEO keyword research. I’ll leave a link in the description below, but it’s just important to remember that pages rank, websites don’t. The second part is we want to optimize content for Google crawlers. This means that we want to make it as easy as possible for Google to understand our content and align the content that we have with the questions and needs of our customers as they search online with their search queries. This approach is the most effective optimization routine for your SEO marketing strategy to drive traffic and close sales. We can leverage these simple tricks to improve online visibility. A lot of the tips that we go over a little bit more in depth, but these are high level, uh, easy to grasp and you shouldn’t have a problem with implementing these. Trust me guys, these can have a big impact on your SEO marketing strategy with the least amount of time, money, or resources. So the first tip is to put keywords in the page URL. This helps Google know your content. The first part of this is you always want to focus on one keyword per page. So if you’re doing travel luggage. Two or three other main keywords in the URL, and we could also think about placing some LSI keywords in the URL. And the best way to do this for from a technical standpoint, is to put that keyword in the page URL. We’ll look at in a second, how that shows up, but also the keyword that you want Google to know that page four and it’s a little bit more tedious or technical. I always like to put hyphens between my words, best travel luggage, best hyphen travel hyphen luggage. Some people used to put under scores, but that’s old school and you should be putting hyphens. There’s no argument against using hyphens between your words in the URL, so just use hyphens and rank and bank! This is an example of using the keyword in the URL. We could see this website is travelandleisure.com, and then in Google I typed in best lightweight luggage and this comes up with that keyword. The primary key word that travel and leisure wants to rank for best hyphen, lightweight hyphen luggage. So this is how optimizing your URL for your primary keyword will look, and this will look a little bit different for your website content, but the overall syntax of how this looks will be the same. The second part we want to look at is optimizing Metadata. A lot of people like to overlook Metadata because they want to focus more on keywords or content. You know, content is king, all that Baloney, but when it comes down to it, you need to optimize content for people and optimize for robots as well. Optimizing Metadata is a important part of that. So let’s dive in and take a look at the second point. Metadata includes the Meta Title and Meta Description. We’ll go over an example and see how that looks in Google SERPs in just a minute. In the past, these were both vital pieces of a successful SEO marketing strategy for your website. Meta Descriptions have kind of lost their power over time and they’re more of just a User Experience. When people are looking on the Search Engine Results Page to understand what that content is before they click, but Meta Titles are still important for SEO. One thing to note is Meta Descriptions have increased in length to about 240 characters, we want to make sure that as you optimize your Meta Descriptions to to optimize for that length as well and when you, when you create your Meta Descriptions. Create this Metadata for people, because these will appear in the Google SERPs and they increase the click-through rate and that’s a great thing to improve your qualified leads and then also, your performance data on your site. Luggage for traveling and then space, pipe space, travel, leisure. So that’s just a format that I always like to use as well with my Meta Titles is I’ll always have the page description and that’ll have a space pipe than a main keyword than space pipe space, my my company name. That just helps to make sure that people know that what they’re looking for. You have under site and always keep branding consistent across your site, because it has your name on it as well. And then the other part of the Metadata is the Meta Description, which you could see underneath that URL, the anticipating a vacation as part of the fun, etc. As you write this information out for your website SEO, be sure that you try to make it as long as possible and use your primary key word in there because you can see that Google highlights the key words that you have in there based on the the search query. That’s just one way to make sure that the user experience and the intent based is there. So always try to fill that out as much as much as you can. Using your primary keyword in the Meta description, just understanding that the meta-description is for people and not much robots. Then the third part of the easy SEO tricks that you can use to optimize your website is to optimize images. A lot of people overlook this part, but images are one of the strongest ways that you can increase your technical and the aspect of people-focused SEO optimization. Search engines look at images differently than humans do when they look through a webpage. The only thing is they don’t look at images the same way that we do. We look at images as visible, pieces of art, whereas search engines currently look at images through the alt tags and file names, this means that you want to optimize file names and all tags, and the best way to do this is to use keywords and LSI keywords in the file name for your images. Using hyphens in between words, and then also try to keep your file name and alt tags similar. So for example, I would use best travel luggage, you know, a business travel luggage, I’m the best lightweight travel luggage, etc. On my SEO copywriting content for your website you don’t have to worry about keyword stuffing image ALT tags, because Google doesn’t tend to penalize you for doing that. And then I always just keep the file name and all similar as possible because that creates continuity between the two elements and it helps Google understand what the two elements mean together. Like the other pieces with the URLs, we always want to use hyphens in between words. This is this an example of the image that we could see on the left-hand side, and then when you open up the html and you can see down there at the bottom that it has the name of the air luggage. This example is an e-commerce site and a lot of e commerce sites tend to have weaker all tags just because they have many products that they don’t want to sit there and over optimize the all tags as is. For your site, I would recommend that each page has about two to three images and each image be optimized with all tags, and Meta Descriptions and other technical factors of your OnPage SEO strategy. So then the file names because that’s going to help you stand out. Grow Your Online Presence & Rankings With These Basic SEO Marketing Strategies! So there you have it guys. Those are three easy SEO tips that you can take advantage of today to increase your online rankings. These are not advanced tactics, but it’s the small details that can help you to rank your site and rank specific pages based on the needs of your customers. So if you could leave a like comment and subscribe below, it helps us out and al share with your friends because that helps us out too. We’ll leave some links and additional information in the descriptions below, but go ahead and check those out and until we see it next time. Thanks a lot for your time, and get out there to rank your website and bank that cash!